Talon for Twitter (plus) gives you everything you could ever need to experience Twitter. 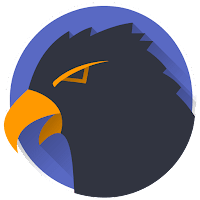 Talon for Twitter is the highest rated pro Twitter app on the Play Store! Here's what makes it so special. It includes stunning layouts, eye catching animations, and that buttery smoothness you should expect from the latest twitter apps. Materialized theme engine for fine-grained color control. Completely custom swipe-able pages for the main screen. Want a list or saved search for easy access? No problem! Don't use direct messages? Go ahead and take them out. Choose what you want to see and where you want to see it. Night Mode and Do Not Disturb Mode. Compact Timeline Layout option to get the most out of your screen space. Follow threads and view replies to any tweet! Have favorite users? See only their tweets or have options to get notified whenever they post a new tweet! Powerful mute options for users, retweets, hashtags, Twitter clients, and expressions. Easily see who has quoted, liked, or retweeted any tweet! 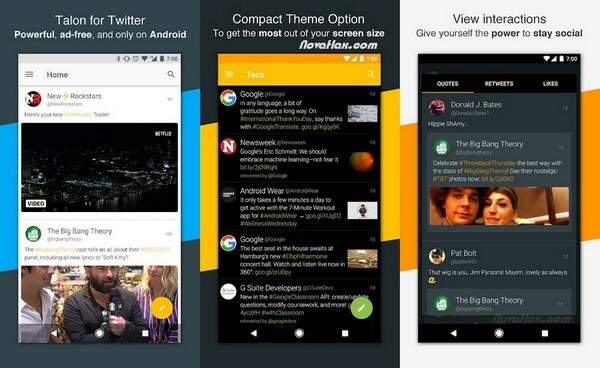 Use TweetMarker to keep your timeline position between multiple devices! Use our awesome readability-style browser for the best web experience of any app. Play Twitter videos and GIFs without leaving your timeline! Talon Search for the perfect GIF from Giphy. Crop, rotate, and zoom to get the perfect photo before you post it! Native YouTube, Twitter GIF, and Twitter video playback. Widgets to view the home timeline, mentions, and unread counts.